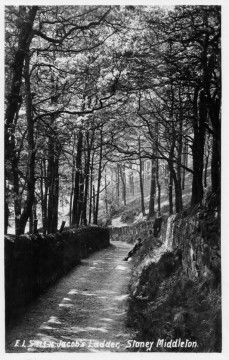 The picture captures Jacobs Ladder as it once was. The path leads from the village to Eyam up a track found by following the road past the Bathhouse and the cemetery. It is an ancient pack horse trail and was probably cobbled, this is evidenced from the stones that still remain on the track. This website and all its content is intended for the pleasure of those who wish to learn more about our village and its heritage. We do not think it is an appropriate platform for political debate, recent comments of this mature have therefore been disabled. I hope those concerned will understand.